NIA CHARLESTOWN NEVIS (AUGUST 10, 2012) — There was no one more fitting in the community of Combermere, St. James, in whose name the Combermere Community Centre could be renamed after but retired public servant and educator Mr. Franklyn Browne. 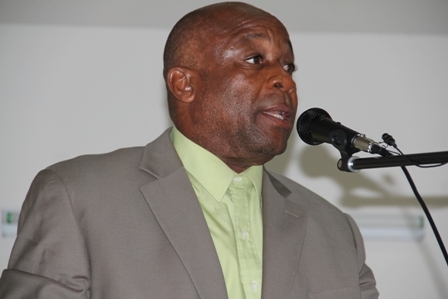 Minister of Social Development on Nevis Hon. Hensley Daniel, made the comment when he delivered remarks at a ceremony to officially rename the facility in Mr. Brown’s honour on August 08, 2012. Mr. Brown served as a teacher in that community for 41 years and had touched the lives of many and on January 31, 2012, he was the one selected by the Ministry of Social Development as the one most deserving to cut the ribbon at the official opening of the first Community Centre for the area. “As a teacher he has given credence to the view that education is the surest means of upward and social mobility. He in a real way lifted many young people out of poverty. The programmes at the centre reflect the embodiment and character of Mr. Brown. 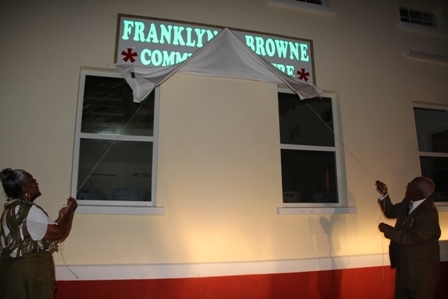 “It is only fitting that as we look around this marvellous community of Combermere in St. James, there can be no other person more fitting in whose name to rename this facility, this great gentleman, Mr. Franklyn Browne. This total and absolute public servant gave 41 years of his life, save for 10 years at New River as a teacher in this community. He has to be recognised and should have been a long time ago” he said. The Social Development Minister reminded that the ceremony was to keep the Nevis Reformation Party-led Nevis Island Administration’s commitment to honour the island’s deserving citizens for many years of hard work and very dedicated service to the people of Nevis, contributed to the many strides made by the island and the work they had done in the advancement of others. Mr. Daniel said he first met Mr. Browne in 1977 when he attended the Induction Course for prospective teachers and described the former educator as a man of integrity, a quality which today was under threat. “I have never heard anyone say that Mr. Browne robbed them, I have never heard anyone say that Mr. Browne failed to give them the opportunity to grow and develop. Here we have a man whose flag is nailed to the most of integrity. “While the dollar seems to be winning the war against ethics; while there is a crisis in integrity, indeed he could say like Robert Moorhead: ‘My face is set, my grit is fast, my goal is heaven, my way is rough, my companions are few, my guide is reliable, my mission is clear. I cannot be bought, compromised, detoured, lured away, turned back, diluted or delayed. I will not finch in the face of sacrifice, hesitate in the presence of adversity, negotiate at the table of the enemy, ponder at the pool of popularity or meander in a maze of mediocrity. I won’t give up, shut up, let up or slow up’,” he said. Mr. Daniel also described Mr. Browne as a good example of a man who had worked devoutly for the good of others and had achieved his own enrichment in the process. 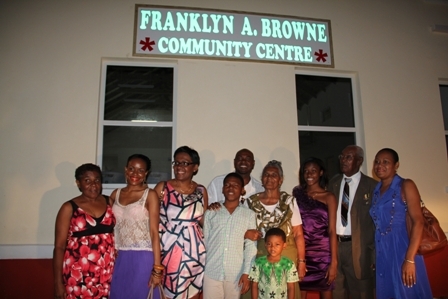 At the end of the ceremony attended by members of the Nevis Island Administration, his family, fellow villagers and past students, Mr. Brown with his wife of many years “Teacher” Lorraine at his side, unveiled the new name of the Centre, the Franklyn A. Browne Community Centre. Other remarks at the ceremony came from Attorney General and Area Representative Hon. Patrice Nisbett, and Premier of Nevis Hon. Joseph Parry who presented Mr. Browne with a plaque. The programme was also dotted with tributes in song and dance including a passionate expression of gratitude from Past Student Mr. Augustine Merchant on behalf of all the students of Mr. Browne.